If you’ve been feeling a little stressed out lately, you’re not the only one — and if you’re in Los Angeles or New York City this week, we have the just the activity you need to chill out. Super-comfy blanket brand Buffy is teaming up with Van Leeuwen ice cream to bring you an afternoon full of relaxation in honor of 4/20 — including a 4/20 sundae — and after hearing about this event, you may decide to blow off work to be there. 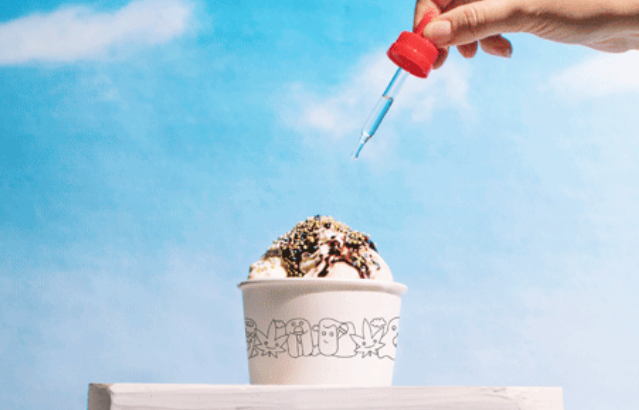 On Friday, two Van Leeuwen ice cream shops (one on each coast) will be filled with Buffy’s cloud-like comforters for some serious chill time, and for $6, you can purchase a fudge sundae topped with cannabis-derived CBD oil from The Alchemist’s Kitchen. Basically, it sounds like the best possible way to spend a Friday. And even if you aren’t into the CBD oil, there’s nothing not to love about eating ice cream while surrounded by comforters. Best day ever! The CBD ice cream pop-up is for one day only, though, so if you’re interested, make sure you clear your schedule. The event is taking place from 2 p.m. to 11 p.m. local time in both New York and L.A. In NYC, you’ll want to head to the Van Leeuwen location on Ludlow St., and in L.A., it’ll be the one on Franklin Ave.
No matter what your plans are for 4/20, you might want to fit this event in. Something tells us that ending the week — especially the week taxes were due! — eating CBD ice cream while sitting on a comforter cloud might just be the best way to kick off a weekend. You deserve it!